Vikki Weldon knows how to climb to the top! Growing up in a family full of climbers, Vikki took to climbing at a young age and was soon excelling in the climbing gym and competitions. Her drive and determination led her to seven consecutive national championship titles and the opportunity to represent Canada at six Youth World Cup events, with her best result placing 5th in Beijing 2006. In the bouldering arena, Vikki has earned three Open National victories and multiple podium finishes. 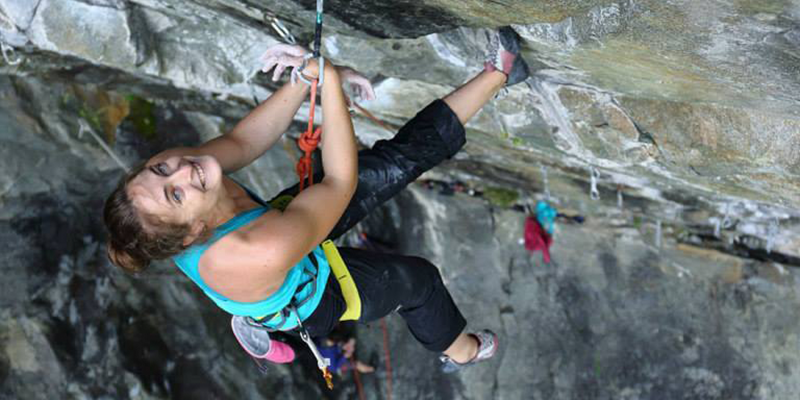 Growing up in Calgary, AB, close to some of Canada’s best sport climbing, Vikki quickly discovered the joy of climbing outdoors. Her addiction to the rock and a willingness to push personal limits led to quick successes. Vikki climbed her first 13a at the age of 15 and has since redpointed multiple 13d’s (8b) and bouldered up to V10. Last year, Vikki became the third Canadian female to redpoint 5.14a (8b+), with her ascent of Eulogy in Maple Canyon, UT. While enjoying a career in pediatric nursing, Vikki always keeps the mountains close to her heart. Recently having discovered the joys of difficult multipitch climbing and traditional climbing, Vikki plans to continue living a fulfilling and exciting life in the mountains. The event was punctuated with plenty of laughter and capped off with a resounding feeling of success.